No gym? No problem! If you're crunched for time or don't have access to a gym, having a go-to workout you can do anywhere, anytime is a necessity. 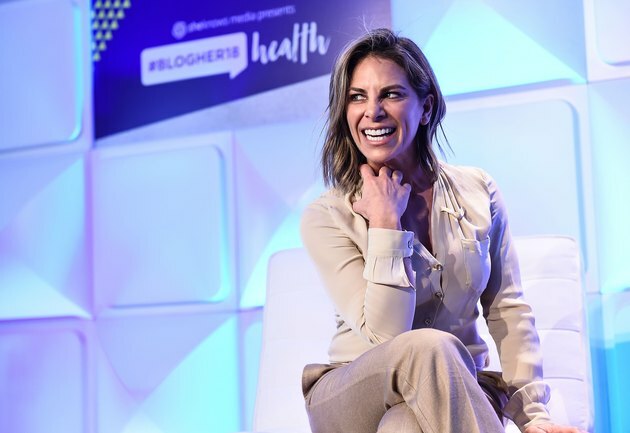 That's why we asked Jillian Michaels, world-renowned health and wellness expert and author of the recent book, The 6 Keys: Unlock Your Genetic Potential for Ageless Strength, Health, and Beauty, to share some tips on working out at home, plus, her go-to at-home workout. 1. You can save a lot of time. The ultimate benefit of an at-home workout, Michaels tells LIVESTRONG, is that it saves a lot of time. "I can waste up to 60 minutes (if there's traffic) driving to and from the gym," she says. Ain't nobody got time for that! 2. Convenience helps with motivation. If you're having a hard time getting motivated, Michaels says the idea of being able to plop down on your living room floor and bust out a quick, 20-minute workout can sound pretty fantastic. That's why the convenience factor of exercising at home — or if you're traveling, in your hotel room — is so appealing. 3. You have privacy. Exercising at home is a great way to build your fitness without feeling like you're in a fishbowl (a.k.a. the weight room at the gym). 4. You need minimal equipment. When it comes to equipment, Michaels recommends having an assortment of free weights — even if it's small (i.e. a set of 3-pound, 5-pound and 8-pound dumbbells). You can also look for an adjustable dumbbell set or power blocks. Or use what you already have. Michaels says you can use either a chair or a table as a platform for step-ups, incline/decline push-ups or triceps dips. 5. The possibilities are endless. If you're worried about training programs or tapping into an instructor's motivation, check out one of the many fitness apps and streaming platforms available online or on your phone. Ready to sculpt and strengthen your entire body? Here's Michaels' go-to at-home full body workout. You can also find more of Michaels' workouts on her app My Fitness by Jillian Michaels. Jog in Place: Nice, easy jog in place. Forward Arm Circles: Make large, alternating circles with your arms from your shoulders. You should feel it in your core, too. Side Lunge Skaters: Step out to the side and drop into a side lunge. Bring opposite elbow to opposite knee, staying low. Glide across center, bringing opposite elbow to opposite knee. Hip Circles: Stand with feet hip-width and bring hands to hips. Press hips forward and circle them around like an exaggerated hula hoop movement. Jumping Jacks: Jump feet apart, arms raised overhead. Jump feet back together and lower arms to your sides. Knee Circles: Bring legs together with hands on knees. Squat down and move knees in a wide, gentle circle. Dancing Crab: Lie on your back, and then lift torso to sitting, one knee bent and one extended. Then, supported by one arm and one leg, lift hips and reach opposite arm to the opposite foot. Lower back into the ground and repeat on the other side. Crab Kicks: Flip over into reverse table. Keep chin off chest and eyes on ceiling. Ankles under the knees. Palms and soles of the feet flat on the ground. Kick one foot up and forward, and then jump-switch to the other. Step Back Plank: Start in a plank and bring one foot forward, placing it between the hands, so you're crouched low. Plant that foot between both of your palms, knee up toward the chest, one leg extended behind you. Bring back knee up toward your hands and feet, tapping the back foot up by hands then back to start position. You want a nice fast pace on this exercise. Repeat on each side. Pop Up Front Kick: Squat down, come onto knee and top of foot and press through the heel of the opposite leg. Lift knee all the way up and extend the foot. Lower back into starting position. Repeat on each side. Squat and Press: Holding dumbbells, squat down. Stand up and press weights overhead. Chair Squat to Alternating Knee Thrusts: Sink down into Chair pose — knees over ankles, flat back. As you exhale, thrust one knee up in front of you as hands come down. Set foot down and repeat on the opposite leg. Standing Mountain Climbers: Stand with one arm in the air with opposite knee toward chest. Switch leg and arm positions. Continue alternating vigorously. Alternating Backward Lunge With Figure 8: As you step back into a lunge, make a figure 8 around your legs with the dumbbell: Swing it out, up and around and down as you pass it under the body and through the legs to the opposite hand. Sumo Touchdowns: Drop down into a wide-stance sumo squat. Holding that position, reach down and tap your ankles, moving your torso from side to side to work your obliques. Crescent Pose With Triceps Pulses: Sink deep into Crescent pose: Front leg at 90-degree angle, back leg straight. Holding dumbbells, extend your arms by your sides and turn your palms backwards, so they face behind you. Press the weights with straight arms behind your torso. Do the left side on round one and the right leg on round two. Figure Four Squats With Serving Biceps: Cross your ankle just above the knee on the opposite leg. Squat back and down and drive weights from the chest out in front of you (like you're serving a platter). As you return to standing, retract the weights back into chest level. Do the left side on round one and the right leg on round two. Squat Jacks: Starting with feet together, squat down in Chair pose. Staying nice and low, jump your feet out and in from squat position and back to chair pose. Walk Out Push-Ups: Keeping legs as straight as possible, bend forward and walk your hands out into a high plank. Do a push-up, and then walk hands back. Plank Ups: Starting in a plank, drop onto one forearm, and then the other. Return to a plank by placing your palm directly under your shoulder and pressing your body up. Standing Shoulder Stretch: Extend one arm across your chest. With the opposite arm, grab above the elbow. Repeat with each arm. Standing Triceps Stretch: Hold one arm up directly overhead. With opposite hand, grab the elbow of the extended arm. Gently reach back, bringing the hand back toward your spine. Repeat with each arm. Standing Chest Stretch: Reach both hands behind you and clasp your fingers. Raise your arms as high as you can to open up your chest and the front of your shoulders. Kneeling Quad Stretch: Get in a lunge position on the ground. Your back knee is on the floor. Grab the back foot with the opposite hand. Press hips forward, pull the heel into the center of the body. Repeat with both legs. Kneeling Psoas Stretch: Start in a lunge on the ground with one foot forward and one foot back. Pressing hips forward, reach up overhead and off to the side, opening up the hips, hip flexors and psoas. Repeat with both legs.